l wanted to do a step by step guide to drawing parrot feathers because they are so different from so many other feathers. They have a very blunt edge. It is hard to keep the blunt edge but also keep them looking light and feathery. 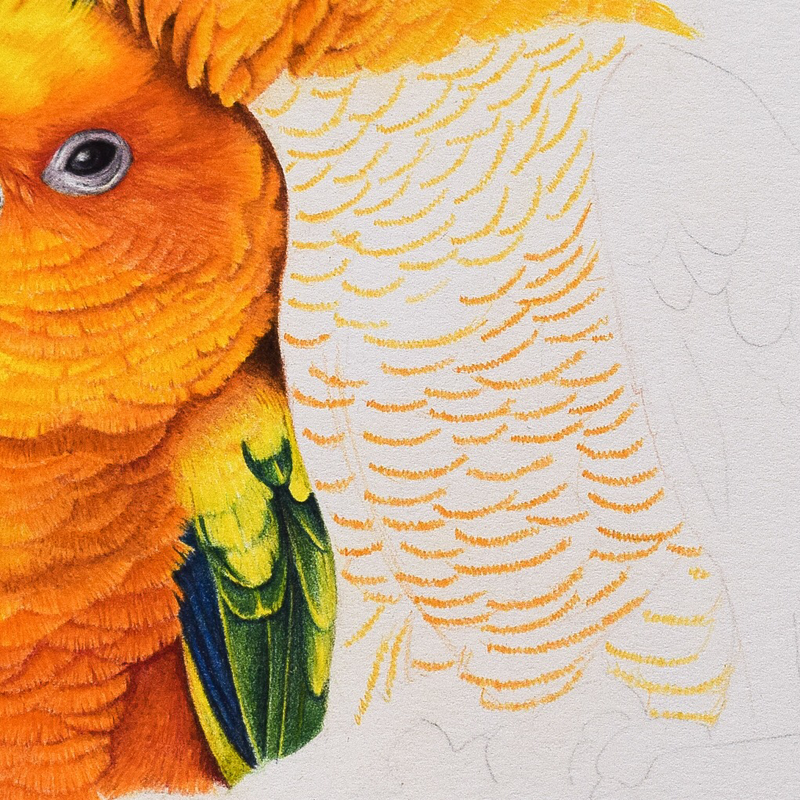 This tutorial will show you my method for drawing parrot feathers with coloured pencils. Here in step 1. I have drawn in the basic feather shapes using a medium shade of the colors l will be using. 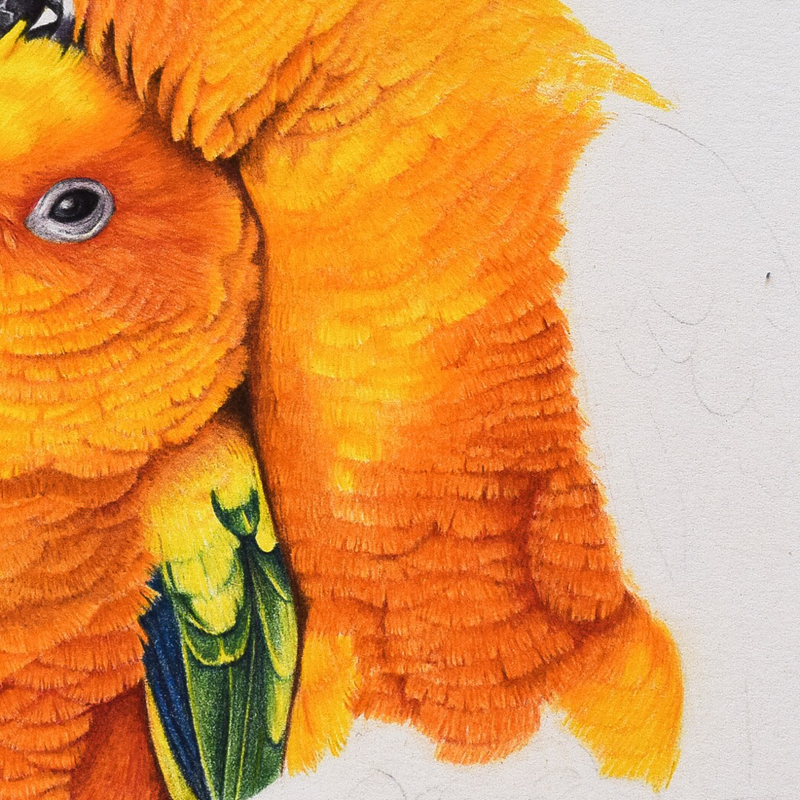 I am going to share all the colors l used for these Sun Conures, obviously different parrots will be different colors, l share them so you can get an idea of how many colors and layers l use to build up the realism and vibrancy of the feathers. At this stage l am paying close attention to the shapes of individual feathers in my reference photo, but l am not too worried about getting the exact number of feathers. As long as you have a similar number of feathers in the right shapes it will work. To outline the feathers l used two shades of pencil, the lighter one for where the feathers are lighter on the bird and the darker one where the feathers will be darker. 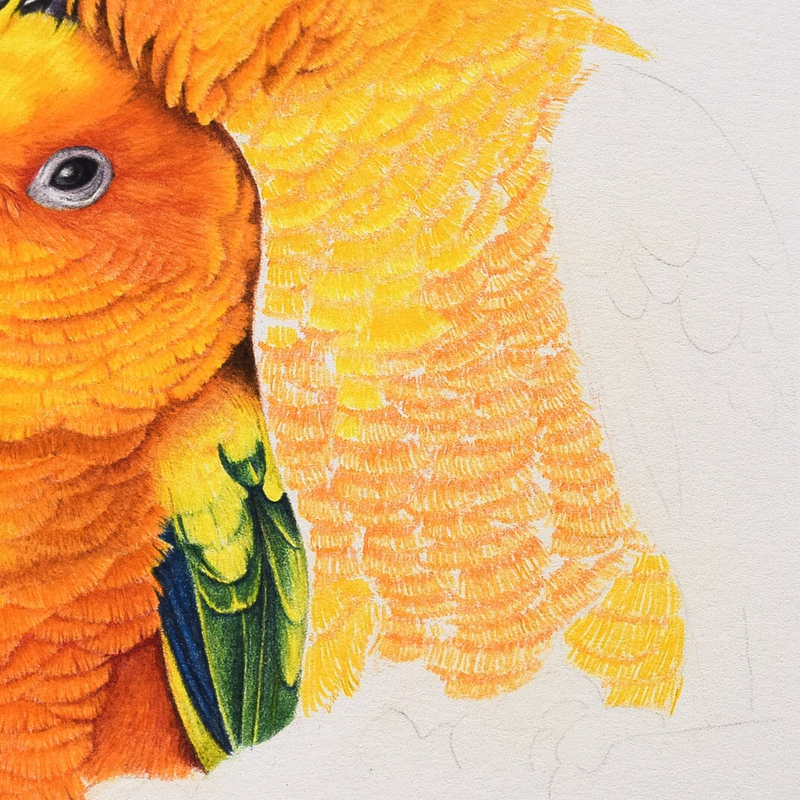 Here l used Faber Castell Polychromos in Dark Chrome Yellow and Cadmium Orange. In step 2. all l have done is work over the outlines drawn above using small strokes of the pencil in the same shades as above. I am following the shapes of the outline with my strokes. This creates a guide for the direction of my pencil strokes in later steps. ln step 3. above l am creating a guide of both individual feather color and direction of pencil stokes. Here l look carefully at my photo to determine the lightest and darkest areas of feathers as well as the medium areas. Then following the guides l have from step 2. 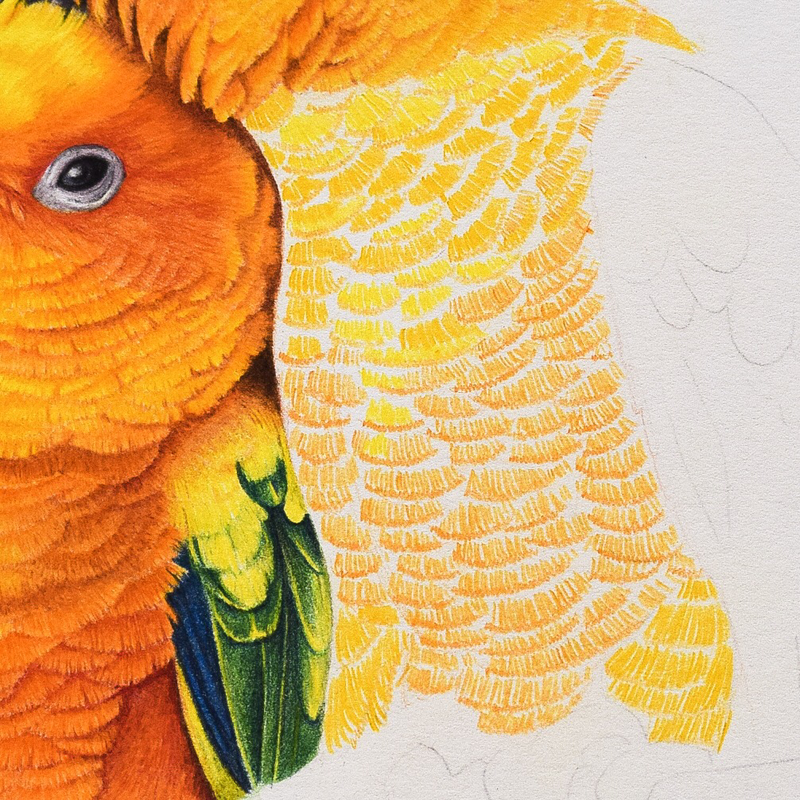 I pencil in these colors, leaving a gap between each feather (this is to begin to build shade in the next step). It is really important to take your time and keep the pencil strokes going the right way. 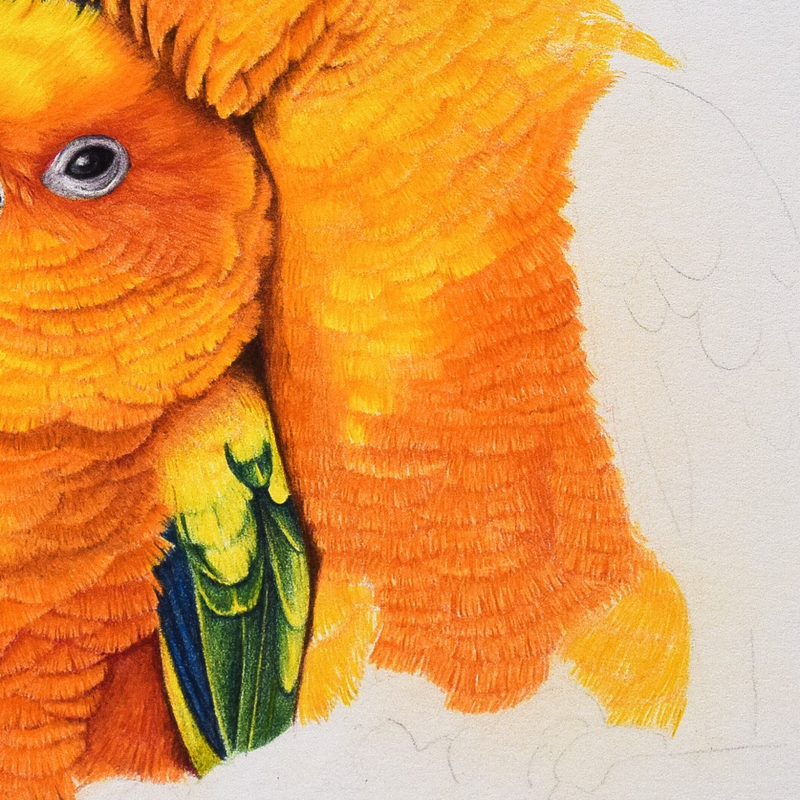 For this step l used Faber Castell Polychromos in Dark Cadmium Yellow, Cadmium Yellow and Dark Chrome Yellow. ln step 4. I begin to add in the shadows. I don’t want to go very dark at first. This is just a subtle change between one feather and the next. I fill in the gaps left in step 3, also overlapping the color slightly over my previous strokes. 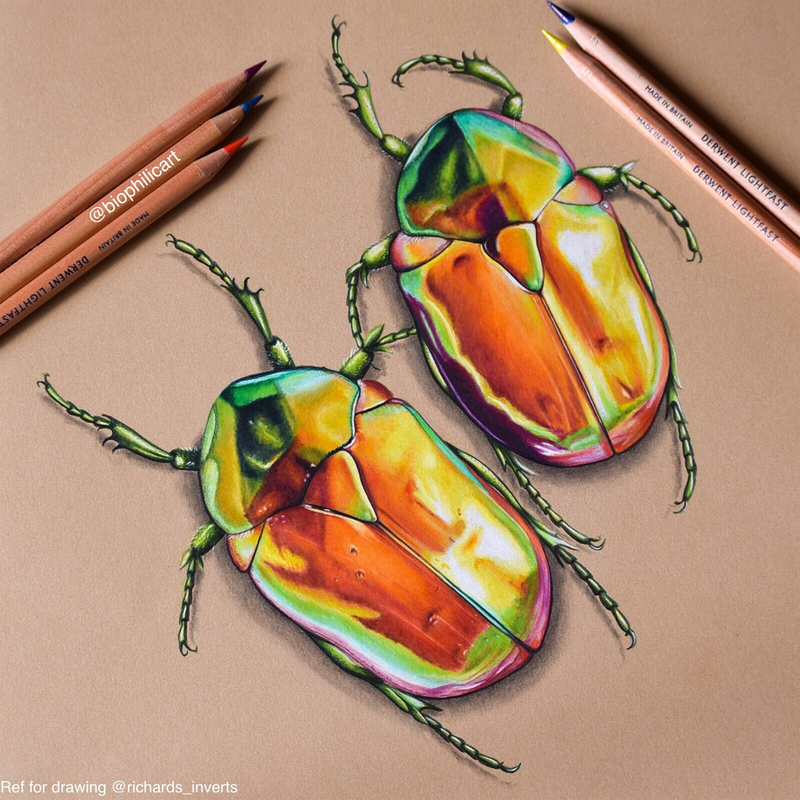 To do this l use Caran D’ache Luminance in Orange and Faber Castell Polychromos in Cadmium Orange, Dark Cadmium Yellow, Orange Glaze and Dark Chrome Yellow. Step 5. Is where the biggest change takes place and where the drawing starts to take on a more realistic look. This step requires a lot of time and care. Here you need to really look at your reference photo, because now you start to build individual feathers, this means you will need to pick out where areas of feather are darker or more defined. Look for where the shadows are darker. Pay special attention to the lightest areas - to keep them light. Make sure to keep all your strokes the right size and the right directions. The colors l used here are Caran D’ache Pablo’s in Venetian Red (this was simply to add some areas of light shade over entire sections), then Faber Castell Polychromos in Cadmium Orange, Dark Chrome Yellow, Cadmium Yellow, Dark Cadmium Orange and Cadmium Red and Caran D’ache Luminance in Golden Yellow, Cornelian and Scarlet. In step 6 above the only difference from set 5 is that l have defined the edges of each feather in a darker color and l really wanted to add this step to show you how much difference a small thing like this can make. If you compare it to the previous photo you will see how much more textured and real the feathers now look for this simple step. It takes a little time and a a lot of care but l have created definition between feathers and even between separate strands of the feathers. I used just theee colors to do this (lighter or darker depending on the overall colors of the feathers in the area l was working). 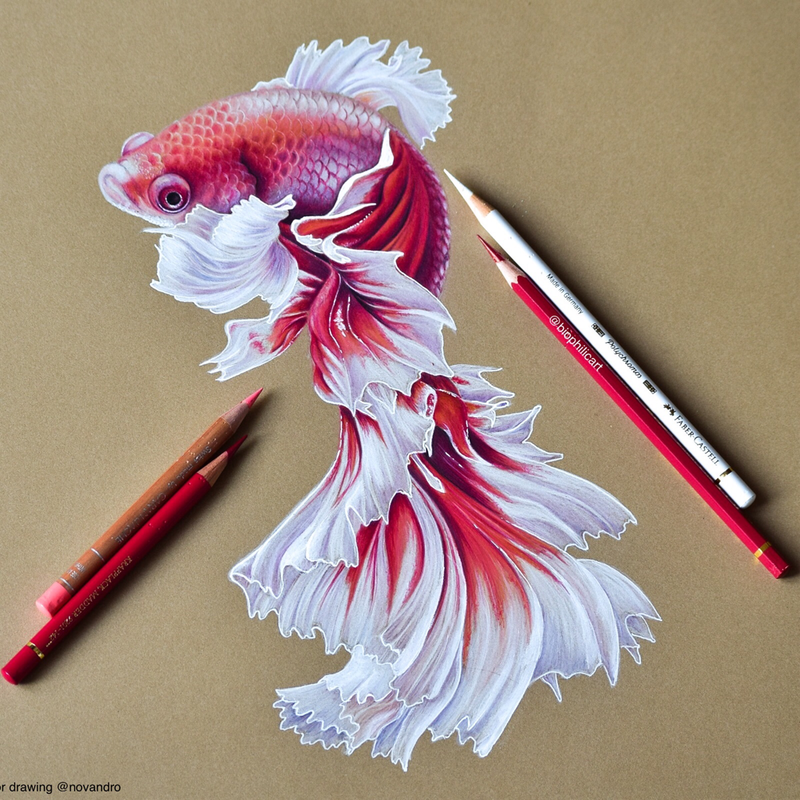 The colors l used are Caran D’ache Luminance in Scarlet, Cornelian and Orange. Here in the final step l stop and take a good look at my photo and really ramp up the color. I use many layers now to build depth and create shadow and shape. Although this is not totally finished (l will add more color and shade as l work on the rest of the bird) it is close enough. The colors l added at this stage are Holbeins in Tiger Lily and Vermillion, Caran D’ache Luminance in Scarlet and Permanent Red and Faber Castell Polychromos in Orange Glaze, Venetian Red and Dark Red.